What’s your M.O. when working to better downtown? One person alone cannot achieve much, but if you can help unite civic organizations, the city government and the church officials to work toward a common goal, virtually miracles can be achieved. I’m associated with six civic organizations. Getting people interested—enthusiasm is so important. Get people involved. And I don’t mean just the people on the committees I’ve been on, but the general public. It’s their city. It’s not just a city, it’s your city. What changes have you seen in the city over the years? To be honest with you, during the construction, it has been rough on us. However, during the construction, I have the exclusive shoe store downtown. And, with these two blocks, these two new malls across the street, truly, we will have created one of the finest downtowns in America. [Oxford will be] almost part of the mall because we’re right across the street from it. It’ll bring people downtown. Not only that, but the 500 condos. There’s something like 37,000 businesspeople downtown, but at 5 o’clock, they’re gone. Whereas, these 500 condos, with two or three people to each one, they’re right here; they’ll do everything downtown. I was originally opposed to The Gateway because I thought it would distract from downtown. But I live in The Gateway now. We had the law changed so that it became part of the Central Business District. It is not an entity itself; it is the west anchor to downtown. Do you get along with Salt Lake City politicians? I get along well with all the city councilmen and all the mayors. It’s good to have the support of everybody. When they opened Interstate 15 after major renovation, I was there with former Salt Lake City Mayor Deedee Corradini and the governor, cutting the ribbon, and I said, “You have all your signs coming into Salt Lake saying ‘Salt Lake, Salt Lake.’ Please, change your electric signs, painted signs, everything to Downtown Salt Lake.” In two days, they had changed their signs. You bought the store at age 20—how have you kept it going for so long? All the officials [buy their shoes from Oxford], including many of the [LDS] Church officials. The shoe I have an exclusive on, Florsheim, is a moderately priced shoe but at a superior quality. Many of my customers I have had—I have been here almost 60 years—have bought from me that entire time. I take a problem as a challenge, so I work real, real hard. Most people take a negative approach, or a middle road, but you have to take a positive approach to problems. And I hope—I’m 82—to have the store for another 10 years, because I cannot belong to these civic organizations if I don’t have this store, and I love being on the civic organizations. 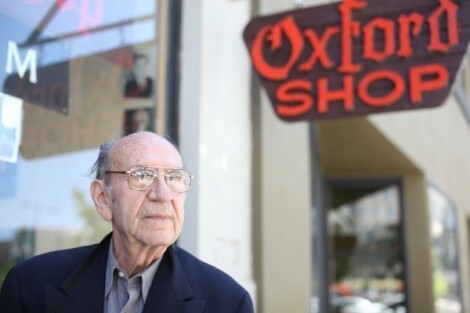 [Oxford was originally] a three-man store—the owner, myself and another salesman. He wanted to sell. We were each making $100 a week, which wasn’t too bad of money back then. But I said, “I’d like to buy it. I don’t have one cent to put down, but I’ll run the three-man store myself and pay you off at $200 a week.” After a period of just five years, it was paid off. That’s when shoes were $40 instead of $100. What’s the No. 1 thing that will improve downtown? We have to fill in Main Street. We hope to get a new performing-arts center in. We get a lot of Broadway shows at the Capitol Theatre. Most people don’t realize it, but most of those Broadway shows are third or fourth stages of a Broadway show. Whereas if we get them [on Main Street], we’ll get them directly from New York City, and it’ll be a wonderful thing. With a new performing-arts center on this side of the street and the Utah Theater, with a year-round Sundance festival type of thing, and then filling in the retail shops, truly we will re-create Main Street.